Synopsis: Jin Da Hua (Nikki Hsieh) has buckteeth and an unfortunately prominent mole on her face that has caused her to be teased and ridiculed throughout her life. Down on her luck and in need of money, Da Hua’s fortunes change dramatically when she crosses paths with Ou Yang Tai (Chris Wu), who just lost his beloved fiancé, Du Liang Yan, in a hiking accident. Because Da Hua bears a slight resemblance to Yang Tai’s fiancé, he makes her an offer she can’t refuse. He will pay for plastic surgery to transform Da Hua to look more like the dead Liang Yan if she will agree to enter into a contract marriage to help further his career. With a beautiful new look and the life she has always wanted, Da Hua just hopes that her transformation is enough to turn the head of her adopted brother and first love, Lin Guan Jun (James Wen). 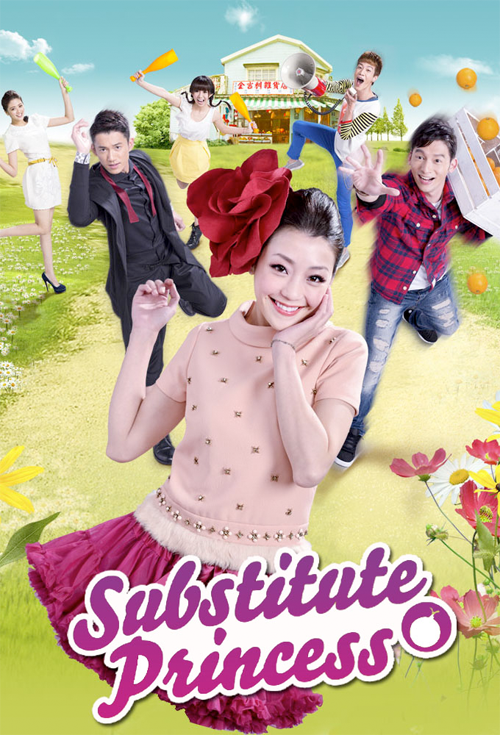 “Princess’ Stand In,” also known as “Substitute Princess” and “King Flower,” is a 2013 Taiwanese romantic drama. Terry and Liang Yan, the "perfect" couple? OKAY so I'll have to admit the ending surprised me. I was SO, SO, SO sure that she was going to end up with Guan Jun because it seems that's how most dramas go. They created Terry to be TOO perfect. I mean what the heck is even wrong with this guy? ... nothing. He's handsome, rich, caring, selfless, has a good job, etcetc. What's not to love? It would be hella weird if Da Hua had no interest in him. But that's the thing that bothers me about this show... it's too unrealistic. Don't get me wrong. I love my dramas because it allows me to dream and kind of escape from the harsh realities of real life. However, this level of unrealistic-ness (is that a word lol) was too much for me. I'm not sure if any rich handsome dude would wait 3 months for an ordinary girl. And why did Guan Jun, who was so determined to fight Terry for Da Hua, suddenly back off to let her be happy with another guy? Nothing makes sense to me lol. The first three episodes is the back story of Da Hua. While it was long and I was so desperate for her to transform, the episodes are necessary to watch. The transformation from mole and buck teeth Da Hua and Liang Yan pretty- Da Hua is REALLY different. They look like two different people! Who would you choose? TEAM TERRY! Da Li is my favourite character LOL - dude is so in love with Ah Xi and doesn't ever give up on her even though she abuses him so much. My favourite kind of relationship/couple! ahahah. It got annoying when she'd just be mean to him for no reason. I mean we all know it's love but damn, give a guy some love!!! I have to mention when Da Hua was pretending to be Liang Yan, I fell in love with her work outfits. They would all be so put together. I wish somebody had done screencaps of all the cute outfits she had because I would love to imitate some of those outfits. Can I just have her wardrobe? Did Da Hua become Liang Yan's dad's goddaughter? All in all, this drama was OK. Nothing too spectacular but worth while watching. I'm fluent in Cantonese so now I feel like I can understand more Taiwanese, which is awesome! are they twins? they look alike in some ways and grew in a single parent household.